This blog post really is the starting point of my commitment to serving you greater this year within the online space. 2018 was all about hard work behind the scenes. (I’ve helped many of you get started with essential oils or maybe you completed my Awakened Mama course where we did intensive and private calls together). This year I’m welcoming a new baby and so for the first three months or so of her time earth side I’ve prepared lots of online content ready for you. My hope and intention is that it will inspire you into deeper levels of health, wealth, leadership, money momentum and freedom. And ps if there is something specific you would like me to write about feel free to shoot me a message on either Facebook or Instagram. I’m all ears. Also before I dive into today’s blog I wanted to let you know that I’m also starting up my monthly newsletter again. My intention with this is to share updates on my latest content (like these blogs) so you don’t miss them and to keep it real with you. I’m going to save my most vulnerable, real and raw posts for my monthly newsletter. Think of it like not just ice cream, but ice cream with your favourite toppings and sauce dripping all over it. Ha! In the past I’ve opened up lots via my Instagram account but I’m going to save more of that for my newsletters moving forward. So anyways let’s chat money. This is a big topic I want to focus on this entire year. 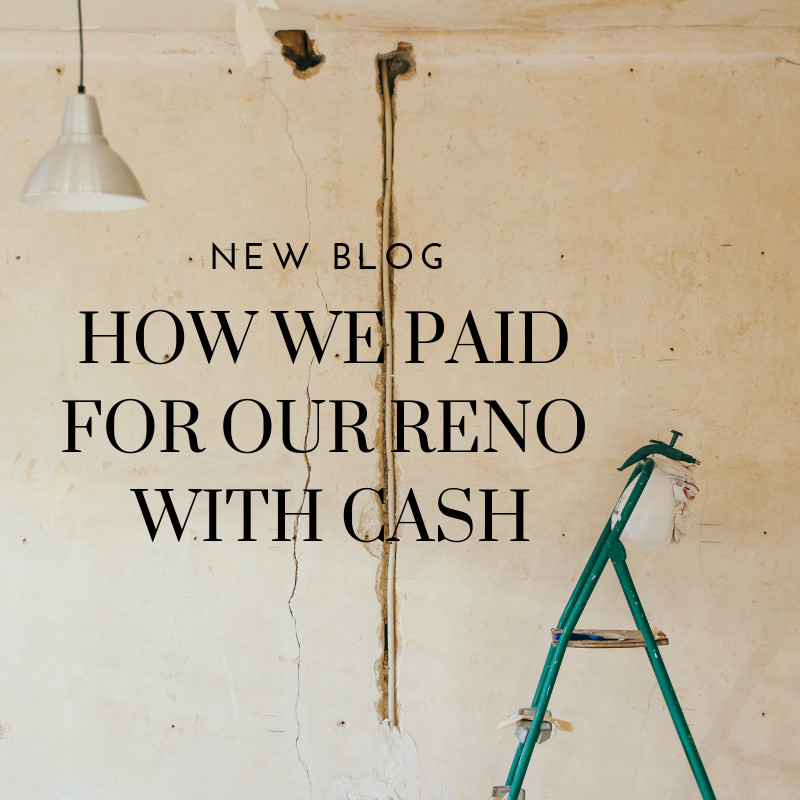 If you’ve ever done a reno you know that it can be expensive. Similar to putting a down payment on your first home perhaps or buying a vehicle, reno’s can cost lots of money. Here’s how we paid cash, direct from our chequing account and acquired zero debt for this project. If you struggle with patience or this brings instant resistance your way this may trigger you a bit but stay with me. Living like or “keeping up with” the Joneses as the saying goes doesn’t interest us not one bit. While we’ve been building our business over the last 7 years we have been patient and smart with our spending, mostly choosing to make edgy business investments that would propel us forward. (Like hiring help, coaching for our business when needed, website and/or marketing fees etc). We basically lived like most people are unwilling for 5 years, so we could live like most people can’t for the rest of our lives. And health. I can’t forget about this part. We have always prioritized our spending on our health first and we do get edgy here. Even in the beginning when money was tight I was always guided to make edgy purchases when it came to our health. (And I’ll talk about this more in point #2 - those edgy decisions that are intuitively guided and test our trust muscles). Since we’ve been guided to be wellness based entrepreneurs this has been vital for us. Part of what we’re selling and offering to people is our wisdom based on our experience and if we’re not living out a vibrant life then who the heck would join our programs, purchase our products, trust our guidance or attend our events? Congruency with what you’re teaching as entrepreneurs is key and so we always knew we had to put our health first and trust the process here. 1- Buying and preparing organic food, supplements, essential oils, kitchen equipment like juicers/blenders and the best quality water filters. Not all at once, but small upgrades each quarter of each year. 2- Taking last minute trips or retreats if we needed a quick soul refuel week. And we don’t stay at resorts who offer McDonalds if you get what I’m throwing down. We do detox retreats, yoga retreats or higher end resorts with quality food. 3- Booking in sessions with energy healers, massage therapists or other wellness based therapies we needed to stay full of life force energy. (With no life force energy you’ll drain yourself of passion which is vital for your work as an entrepreneur. Don’t skimp here or you’re done in my opinion). Then, we put our money first too. Instead of gravitating towards the shiny things that most people in socitey gravitate towards in order to fulfill a quick high or an unmet or unhealed emotional need, we spent our time learning about how to take care of the money we were making. 1- Basic stuff like learning to track our monthly income. Here’s a spreadsheet to help you with that if needed. And below is a screen shot from my personal google drive. I have a folder for each year with spreadsheets saved under each. 2- Putting away what’s needed for tax time and saving 10-15% of everything we earn. We admittedly didn’t do this in the beginning because man, those first few years as entrepreneurs can be tight. But then we got better at prioritizing our spending and once this habit kicked in, we were off. 3- Interviewing and finding the right people to help us learn how to invest these savings. 5- Credit cards we pay off entirely every month. We only own two credit cards. One back up in case a big business expense comes down the pipe (and we use this to hide Christmas gifts we get for each other etc) and one that I place all my main business expenses and/or online purchases on. 6- Once we were comfortable with this plan (bank account at a solid 5 figures per month, business revenue at 6-figures or higher, savings plan automated monthly etc) then we looked at how we could treat ourselves and have fun with the design of our dream home. I also just want to point out that I’m not a control freak when it comes to money and I also don’t subscribe to that way of being either. We’ve been guided to follow the above principles yes (and you may be guided in a different way) but we also first and foremost follow principle number two: it’s not our money. Early on in my business I was guided to take what felt like risks that looking back seemed SO scary at the time but when I hear of what some entrepreneurs have done to put forth their vision in the world, what I was guided to do was peanuts. Things like putting money towards business investments, throwing some big expenses on a line of credit for a period of time, getting my business going, basic things I needed like a website or help around the home, healthy food etc. It’s so funny how this was SO scary to me. But what carried me through is that I knew and trusted in the fact that I was acting on the divine plan above all. And when you’re acting on the divine plan, it’s not a risk my friend. It’s acting on the divine plan. Doesn’t that just feel better when we frame it that way?! As mentioned, let’s move onto the next thing we did. What the heck do I mean by this? Just like our business is not our business, our money is not our money. Our home is not our home and our kids are not our kids. They are all the manifestation of God/our inner teacher/our soul whatever language fits for you there. When you surrender your life (I wrote an entire post on that here) and commit to being a follower of the divine plan, you’ll be guided within everything that you do. How to spend, what business to join or start (if any), what career path you should follow, how to fuel your body, how many kids are waiting to choose you as their parents. We treat our money no differently than we treat the rest of our life. It’s not ours. It’s up to us to ask/pray/journal about how we should use this money to make manifest of more hope, healing, light and love in the world. And then it’s our job to LISTEN to the guidance that comes through. Many, many people would judge this way of being, call it quackery or make fun of it while drinking wine on a saturday night with the rest of their broke friends. But what’s really happening I believe is they are quietly judging themselves. Because those who attack this way of being are simply triggered because they likely have unconscious shame around their lives. They are following something too. But it’s not the divine plan. They are following society’s mould and not their heart. We have a choice in terms of which path we choose to follow. Grow up. Also. You can’t lead if you can’t follow. And I know many people who pay attention to my work want to be powerful leaders in the world. And maybe you’re on the cusp of that. But my question to you is, are you truly TRULY following the divine plan and asking to be led in all areas of your life? In career, relationships, money, all of it? Or are you hiding behind a need to control who your ego thinks you’re here to be. Or perhaps you’re hiding behind 18 angel cards a day or the latest astrology reading to tell you. Signs from God/your higher self may manifest here and there to help you YES. But if you’re obsessed with looking outside of yourself for the answers, you need to grow up too. It’s all apart of the divine plan for hope and healing and the quicker you surrender and follow the guidance that comes through, the quicker you step up into your role as leader and true light worker. Following the divine plan always yields remarkable results and trusting the timing for us has been key. We could feel it in our bones that the timing was perfect to start designing our dream home. As you get more practice in with respect to following higher guidance and truth in your life, it actually starts to get easier and easier to feel into exactly what’s coming next. And the momentum never stops. It’s BEAUTIFUL, grace infused and freeing. Keep in mind the analytical scientist would laugh at a blog or tip like this. Because there is no ‘research’ paper to back such a theory up about divine guidance. Are we truly still living and leading from a place where we need validation from a research paper instead of our own inner connection to authenticity and truth? Some are yes. And I share this to make you laugh (if you get this and resonate, you’ll laugh) and to help awaken some of you because maybe you’re learning to let go of control still or maybe you’re UNlearning what’s been taught to you within this realm. I personally don’t follow or take advice from people who only live and lead from “science”. While I find value and respect in science and research (that’s done with integrity) intuition and a relationship with our inner teacher to me carries more weight. And our results speak for themselves. And so will yours when you trust the divine timing. Of all of it. Was this blog helpful? Tag a friend on social, share it, spread the love.